The official countdown until the big game is totally on my friends! If you need to whip up some fantastic hearty creations for game day, you’ve come to the right place. 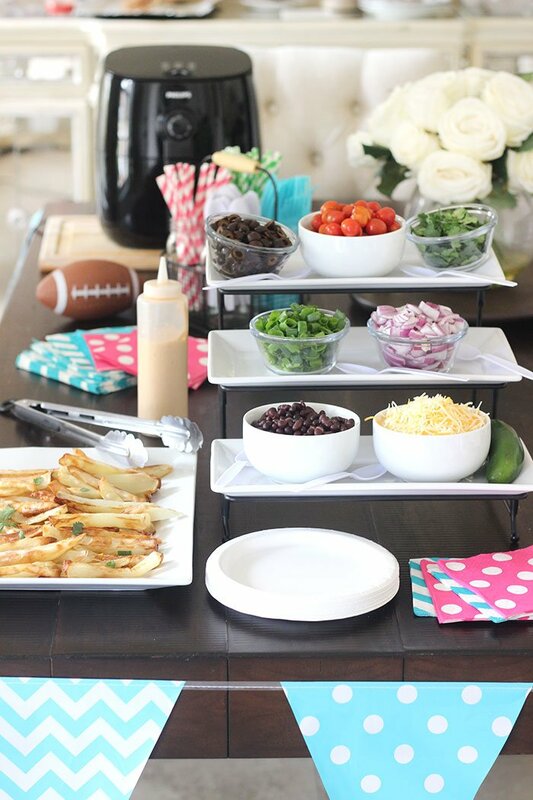 Today I’m sharing this fabulously fresh Nacho Bar French Fries party spread! Prepare to be hungry! This post was sponsored by Philips Kitchen Appliances as part of an Influencer Activation for Influence Central and all opinions expressed in my post are my own. Here is the thing… this mouth-watering party spread is actually made with less fat thanks to Philips AirFryer. I’ve been considering trying one out for lighter food prep for ages and I finally had a chance to try it out. 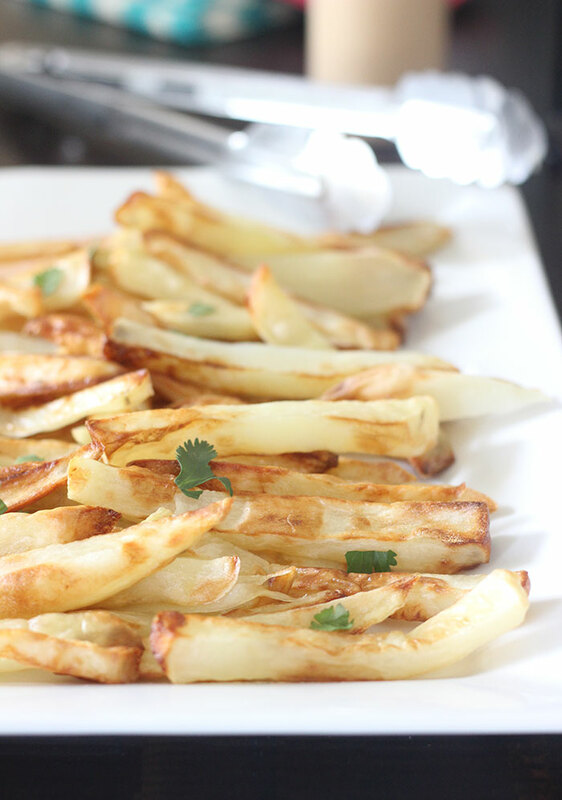 One of the most intriguing food ideas for the AirFryer has definitely been french fries. 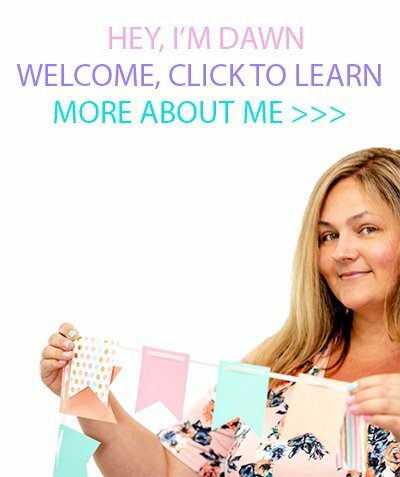 Let me share how they’re made in just 25 minutes! I came up with the idea to make lightened up french fries and serve up a nacho style topping bar. Total crowd pleaser and nobody will be missing the extra oil in those french fries. 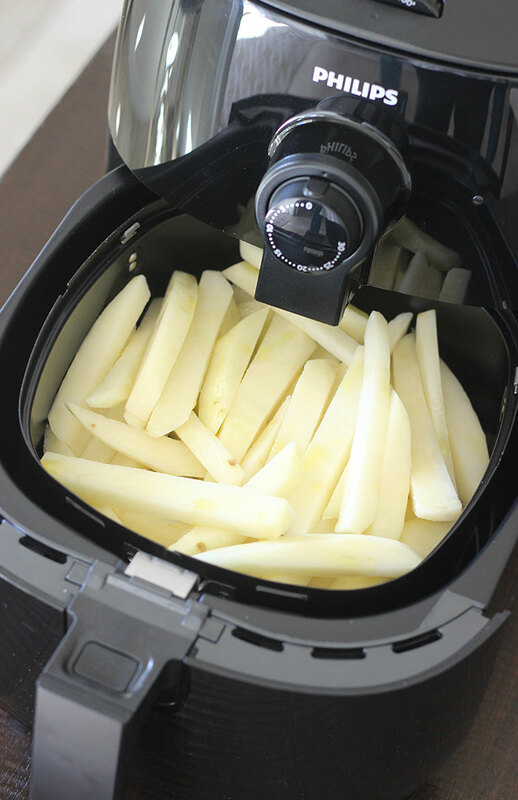 In just four simplified steps you can make fries in this airfryer. Are you ready for this? Let’s do it! Cut – peel your potatoes and cut them into fry shapes. This can easily be done by cutting each potato in half. Then cutting each half lengthwise into strips. Place the pile on the side and cut additional slices through. Repeat for each potato. Soak – once your potatoes are sliced, soak your potatoes in cold water for 30 minutes. Don’t skip this step. It helps to remove the starch for better air frying. Dry – Remove the potatoes from the water and dry them thoroughly. 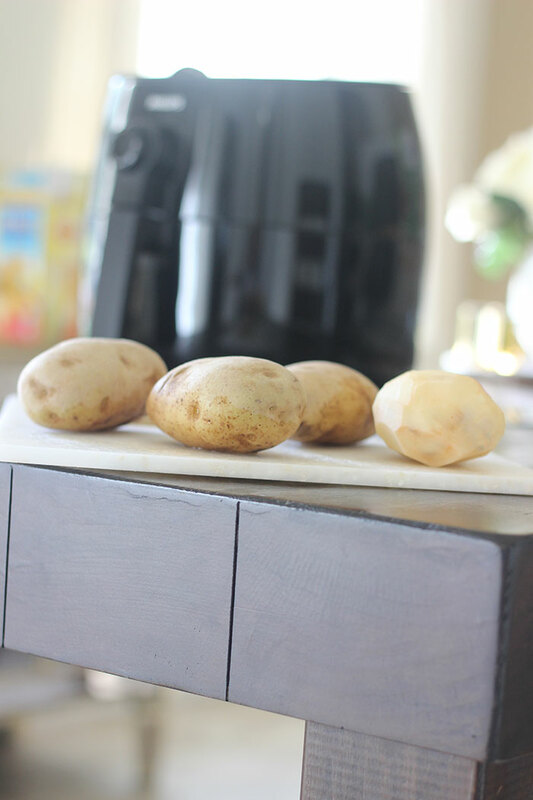 Air Fry – place the dried cut potatoes into the Philips AirFryer basket. Drizzle the olive on evenly on top and add salt and seasonings. Shake or mix in the basket to coat the potatoes. Set the cook temperature to 350° and set the timer to 12 minutes. As soon as the airfryer stops, shake the fries vigorously. Be careful to not touch any hot surfaces on the airfryer while you do this. Then, cook for an additional 15 minutes. Check on your fries to make sure they are cooked to perfection. Cool before serving. I recommend using tongs to remove the fries from the hot airfryer. 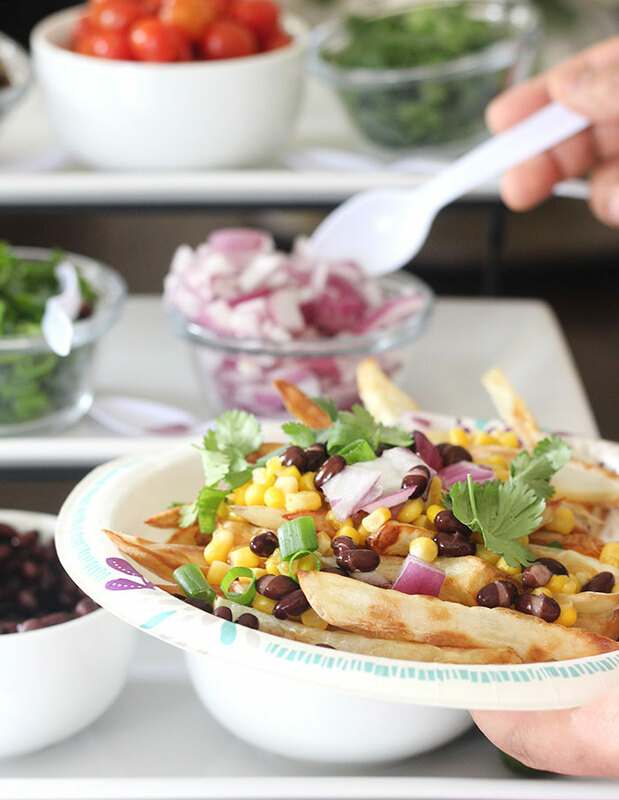 While you’re cooking your fries, it’s time to whip up all of your delish nacho bar style toppings! Get ready to pile your airfryer french fries with fresh and delish toppings galore! The sky is the limit! 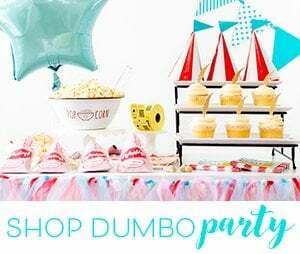 You can even do different themes like a chili french fry bar or simple just adding more traditional french fry toppings to your spread. Yum! Watch your guest’s faces light right up! Who doesn’t love a good food bar? They’ll be nice and full on game day and I bet they’ll have no clue that these fries are prepared with way less oil than traditional methods. Score! Want more inspired ideas to take your game day to the next level? 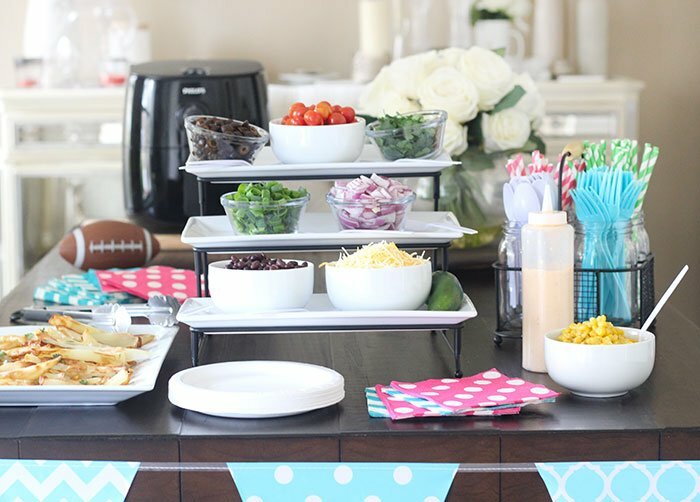 Get more Philips Air Fryer recipes for game day by following their Game Day Pinterest board. Let me know which recipes and ideas you want to try! I bought an airfryer and I'm enjoying the recipes I make with it. Simply incredible. I really need to get an air fryer! These look so delish! Man, what can't this thing do? I have got to try these fries! An Airfryer seems like it would be a great addition to my appliances! I like that they reduce the amount of fat too. 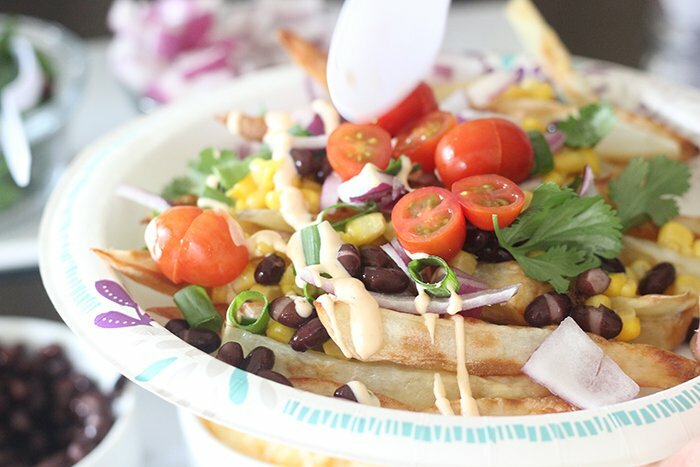 I am a total nachos lover, adding french fries to the mix makes it all the more yummy! I still haven't tried making fries in the air fryer. Wings are the best and easiest since there's so little prep. Guess I'd better try cutting some fries to see how they compare! I really want to get an air fryer!’ This recipe looks so good and perfect for the big game! We totally need to do a nacho bar with french fries!! Perfect for the super bowl this weekend! Now that is an awesome appetizer idea! I love it! I wish I had an air fryer so I could make this! It looks delicious! Air frying is such a great way to make fries and so healthy. 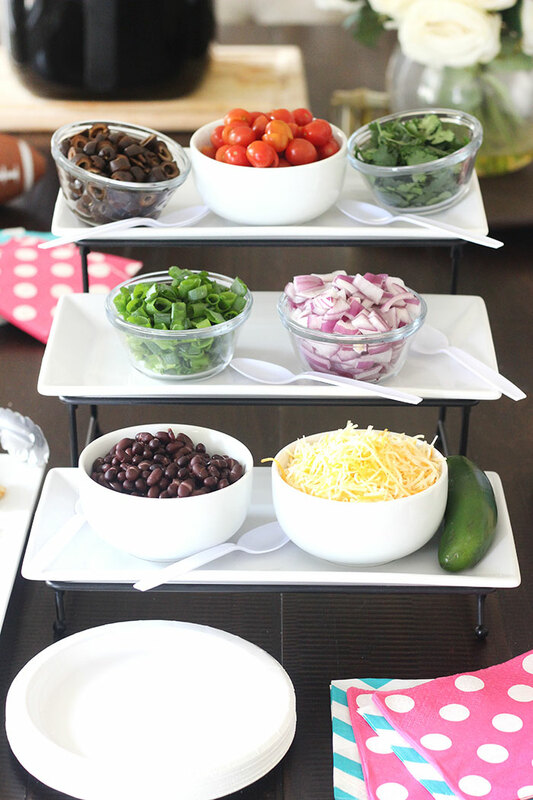 Your toppings bar is so game ready I will try and recreate it for my party.